Sailing in a tea cup...... OR.... Thin Water! As it turned out, we spent all of March in New Orleans, first, just attending the festivals, and working on the boat, then we took a day and accepted the kind offer of Wilson Frye to store our truck & trailer at his place as we cruise. Once back to Guen, we spend a few more days waiting on a decent weather window. Once the weather looked OK, at least for the next few days, we headed out. 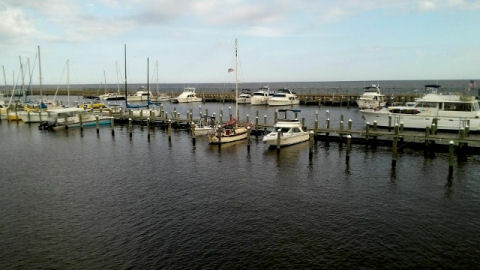 We had our choice, follow the ICW (Inter-coastal Water Way), a long canal, or jump out into Lake Pontchartrain. For us, it was the lake. As it turned out, we could have taken the ICW. The wind was on the nose all the way to the anchorage we decided to visit. And on top of that, I THINK the ICW may have had deeper water! On the lake we never saw our depth gauge read more than 20 feet! Our first anchorage (North Shore by the I-10) was nice. Large, well protected and good holding. We spent a nice quiet night and got some great sleeping, finally at anchor. 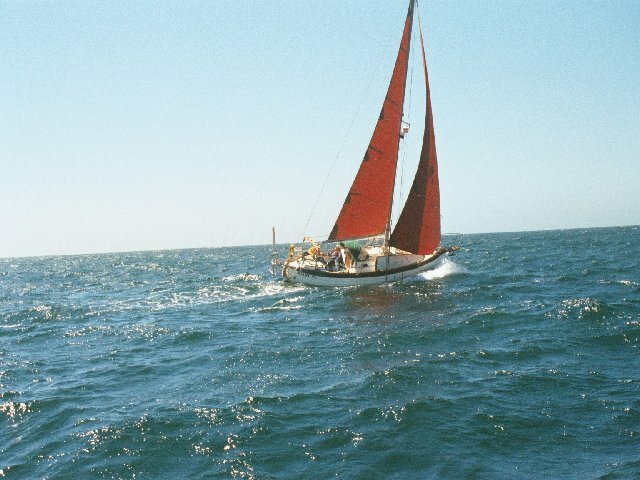 From there, we had to motor, wind on the nose, through the channels to and through the Rigoletts. We had to call the CSX rail road bridge to pass though into the Mississippi Sound. We then made our next anchorage. This one was behind Rabbit Island. It was well protected from the waves and boat wakes, but the holding was not all that good. Once again, the depths in the channel never showed more than 20 feet. Once more, you never know what to expect on the water. 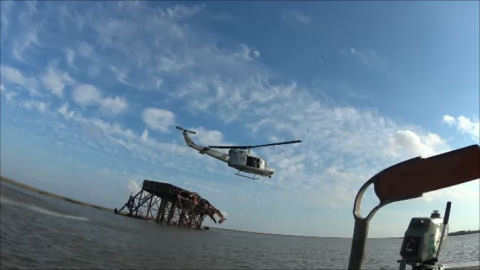 We were anchored by a rusting hulk of a wrecked oil rig. But the excitement came when a National Guard helicopter started hovering not 20 feet off the water and reeds, just 200 feet from us! NICE SHOW GUYS!!! It was then time to start our easting. Wouldn't you know it, the wind was coming out of the east, south-east. BUT, once we past Heron Bay Pt, and we could make our course more north east, we got to raise sail and had some motor sailing. However, that south east wind was kicking up the waves in this shallow waters making it a sloppy sail. We were looking at the Active Captain app on our Android tablet and saw a possible place to duck into called “Pass Christian”. So, not on a schedule, it was a short tack to port and we made a safe harbor. NOW I have to tell you this was also our FIRST time using pilings (NO DOCK) fingers. So, it did take us 2 tries, and a few helping hands on the doc, to make it in and we then were getting on and off over the bow. I had always wondered how we might “Med Moor”. Now I know. What a surprise. We came into the Po-Boy fest taking place in the parking lot of the marina! FOOD a plenty, live music, an antique auto show and more! We were planning to spend one night, but the weather report was forecasting sever thunderstorms, so we wait once more. This time we have almost no WiFi as we have no booster aboard. After the cold front passed, we did get some sunny weather and decided to move a bit more. As we were making our course, Jill looked up and saw a LARGE flock of birds heading along the same direction. They were black in color. BUT, all at once, they ALL turned away from us and there under sides were a BRIGHT white! Jill said it was startling how fast the color changed. Now when she says she sees some birds, I ask if they are “Startlings”? A new breed of bird? 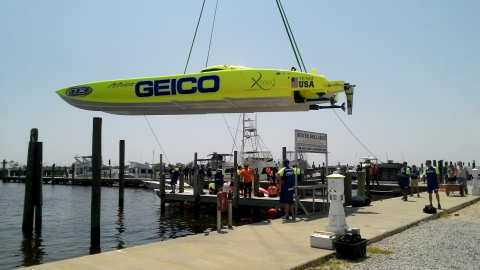 Although the skies were sunny, there was still a lot of short period wave action and we decided to pull into Gulfport. They have a very nice marina. It looks very new and the people were great in welcoming us. They assigned us a side tie (no pilings). At first this seemed like an ideal spot. Now the down side, all the docks are rigid, on pilings. NO FLOATING DOCKS. And the docks are at least 4 foot above the mean water line. And on top of that, the bits to tie off to are on the pilings above the dock! This meant that to tie off, our dock lines were almost pointing up at a 75 degree angle. And with a tide range of 2 foot or so, I was up at 0200 to adjust the lines. They were either to tight or we were floating away. The other lesson learned in this area was the wind induced tide. At one point I looked at our tide chart and it stated we were at high tide. BUT, I could see for myself that the water was a LOT lower than when we arrived. I checked on-line to make sure my tide table was correct, and it was. BUT, due to the wind there was as much as a 4 foot difference. Early in the AM, we headed out for Biloxi. Not a long distance. As we were pulling into the Cadet Point Harbor, just behind the Golden Nugget casino, we saw at least 5 dolphins romping in our bow wake. The water is still not very clear, but it's getting better. As it turns out, we had to order a new chart chip, and this is a nice spot to wait for the delivery. As we walked around town, we saw a tour taking place. We picked up the number and decided that would make it easy to see the place. It was a fun tour that took almost 2 hours and we got our barrings of the layout. As I was up in the Harbor Masters office talking about receiving a package here, I got a suggestion for a good, local, back street restaurant. It's called, “The Filling Station”. Turns out it was an old Standard Oil gas station that has a new life serving food. And I have to say, we were NOT steered wrong! The food was very good and at a reasonable price. The menus are cute, all the items are related to autos. 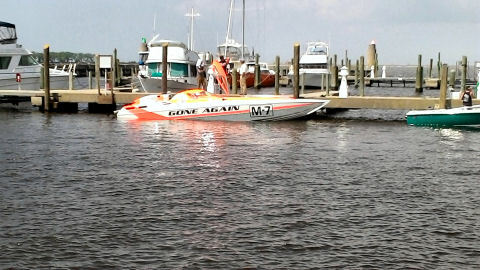 We decided to stay an extra couple of days as they are having the, “Smokin The Sound” speed boat races here. On top of that, many the boats are putting in and out here at this harbor. Not only did we have a GREAT view, we got to talk to a few of the owners and crews. Boat people are friendly. We got to talking to Gone Again (a world speed record holder) and I got a GREAT invite!!! 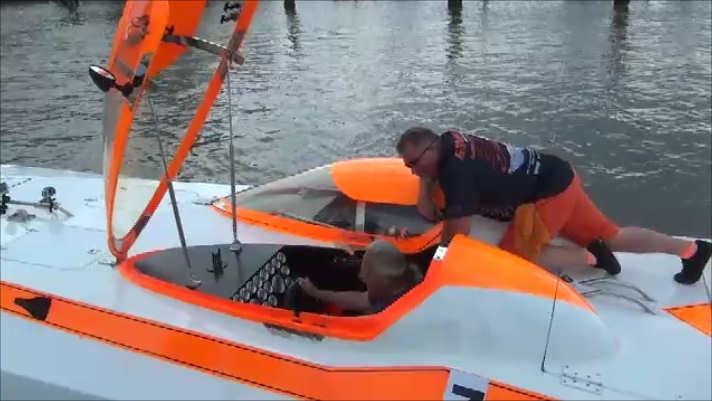 That's ME in the cockpit, getting pointers from Kenny Mungle! As we post this, we just survived 3 days & nights of severe storms, tornades close by, and flooding. Dodging storms seems to be a way of life during this time of the year. Last night, the lightning was constant!